Once again I want to tell you that I enjoyed all your comments regarding my giveaway very much. To Bente and Bev: Congratulation on your belated birthdays. Hope you had great days! To Chook, Danniele, Quiltgirlie and Handmade by Mai: I grow a few inches reading your comments on my stitchery. To Jeanne, Pokey, Amy, Shannon, LeKaQuilt, Lillesnuppa and Sigrun R.: I love my cats and you made my heart go soft (again) by your comment on my cats and photos of my cats. They do bring joy in to my life. To Thimbleanna: I see you in November! To Helle and Marina: I like your comments on my Star Struck quilt. It works as a bed spread in our new camper. To Mary Grece, Pen Pen and Val Laird : Thank you for nice comments regarding our new adventure – the Camper. I will give a full report in August. To all of you commenting on my classes and publicized patterns: Thank you so much. Your comment makes a difference regarding to moving forward. 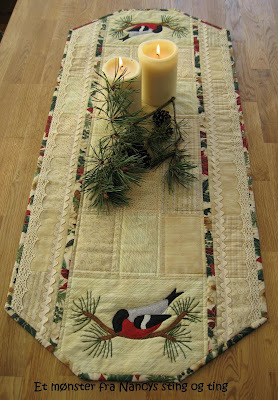 To all of you who read my blog enjoying the mix of serious quilting issues and a variety of everyday life and chit chat. That me. To May-Britt: Thank you for getting me started in the world of blogging. Thank you so much for birthday wishes both on my blog and Face Book. I had a calm and relaxing day. No big fuzz. Sigrun, you are the lucky one! E-mail me your snail mail addy so I can send you a little surprise gift. On Friday we are leaving for vacation and a new adventure in our camper. I have no idea if I’ll be able to blog. Surprises may happen. Have a great summer – or winter. Depending of what part of the world you live in. I have figured that summer in Norway is a different story in Australia. One of the big adventures in the blog friendship connections. I’ll be back with new projects and photos. A surprise visit this morning made it impossible for me to keep my blogging plans. Sorry about that. So please Jette, e-mail your address to me. For those off you that did not win. You will have a second chance. I was so overwhelmed by the response so I have decided to do a second drawing tomorrow evening. Yes it’s a special day, my birthday. Ok. The dead line past half an hour ago …. I am over the top counting how many vicitors leaving coments. More than I ever had imagined! I am very happy. In a few hours I will do the drawing. To be accact – to morrow morning. It’s past midnight my time and I have other important things to attend to…..
An anniversary is an opportunity to celebrate. Giveaways is always fun, and I hope you think so too. I am a bit annoyed because my counter is out of order. Now I don’t know how many visitors I have. That is another story. To celebrate my bloggaversary I have made a surprise bag for one of you to win. All you have to do is leave a message. I would like it a lot if you could tell me something that you like about my blog. A special photo, a post you like or just something in my blog you like. You have only 3 days to enter the giveaway. My bloggaversary is July 10 and the giveaway closes at midnight my time. Feel free to tell your friends. Summer so far has been lovely with nice temperature and sun. This is my out door summer sewing room. Yesterday I made four bags like this. I will use all four in the camping wagon. Wish you a lovely week end. 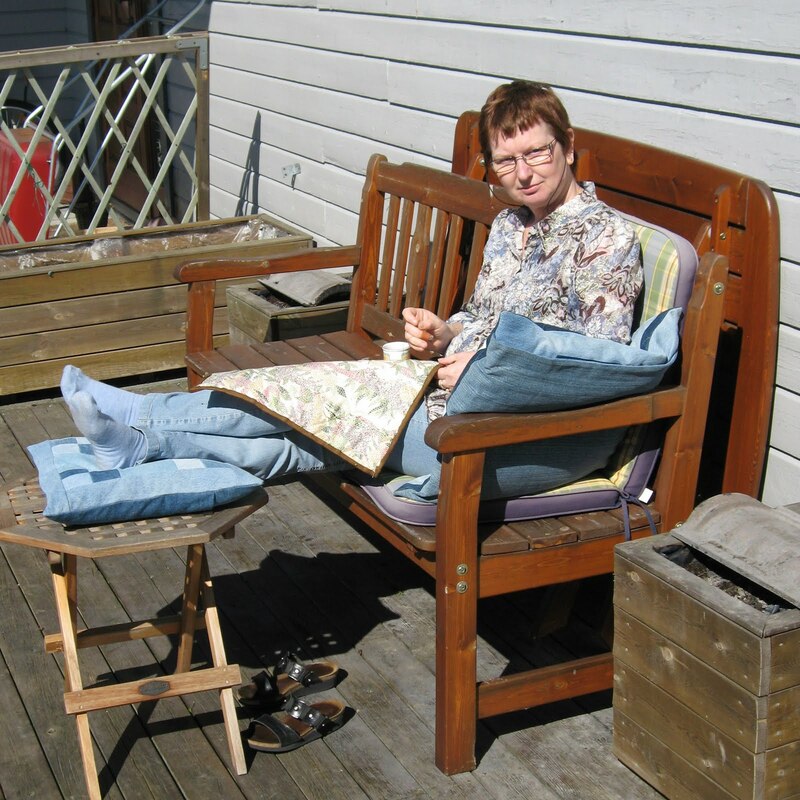 I am so happy to stay healthy enough to enjoy nice summer whether, calm moments on the pouch with a quilting project in my hands and exciting new projects on my scribbling pad. I have finished appliqué work on the four center blocks for a Japanese travel quilt for DS and DIL. I have completed all the pieced blocks earlier. DS have his birthday 1. August, and I have kind of told that this is a birthday gift for the both of them. I don’t know if I can make the date yet. The quilt has to be sent off for long arm quilting. Anyway, I’ll do my best. The Japanese signs on the blocks have a special meaning. The top block is a greeting from a Tea ceremony and the other sign stands for Hope, Happiness and Harmony. DH is a Football (Soccer) fan, and for those of you that are not, there is a World championship going on in South Africa. In our house that means that there is only Football on the big screen. Lucky I have a small TV in my sewing room! My the best team win! Yes!!!!! My creative muse is back! It feels so good. I just had to tell you. My sewing room is filled with gorgeous fabrics. I’ll spend the entire day working on half done projects and planning new once. May have been a strange month. I was totally drained after a week with moving my dad to a flat at a center for old people. No sewing, no creative work. Can you believe it? It feels like May never happened. Well May happened with some beautiful warm and sunny days. The flowering in the garden is beautiful. Look at all the pink flowers. I got a pink color too. I sat too long in the sun in my new bikini. Take care, and remember sun tan lotion. I have been working on projects even if I have not told you about it. Last couple off weeks I have done therapy work for my self. So much is going on in my family. In Northern part of Norway we have a saying that goes something like this: Never so bad that it not good for something. I don’t know if it makes any sense translated. I have definitely had that saying in mind lately. My therapy work last week was finishing the Valentine Heart quilt from a free pattern at Stinas site. Mine looks like this. I have also been working on A Tisket, A Tasket appliqué blocks. This is a 12 part BOM from Bunny Hill. I am currently working on block 5. I am off cause one year late…. I bought a very interesting pattern from Northern Quilt at our annual Quilt meeting last month. This is a very funny keeper for a 3 liters wine bag. The pattern is called Miss Svin ( Miss Swine). I’ll be off to Northern Norway to visit and help my father. He is moving to a senior apartment close to where one of my brothers with family live. May 8th is an important day. I’ll be back before than. This week has not been a good week. It is hard when old folks don’t understand reality and overestimate capability. However I think we are on the road to a good solution. One of the problems is that I have to travel 2000 km and all airports in Norway are closed due to volcanic ashes from Island making big problems for air traffic all over Europe. I hope I’ll be able to travel on Thursday as planed. I know I promised a sewing report, but all my sewing plans just did not happen this week. Sometime life just gets in the way. Relaxing day in the sun. Sunday! I had a beautifull day!! About one month ago I knitted one pair of socks to DS2. I don’t know what he did with the socks but this is what he brought me to repair! I had to buy a stronger yarn to redo the entire foot. I hope his is happy now and that I don’t have to do repairs for a long while. I’ll report my sewing later. Easter holidays have started. For my part I think I’ll spend a lot of time in my sewing room. The weather is not nice. A lot of rain, about 5+ C and quit windy. The good thing is that the rest of the snow is going with the rain. I’m set with new magazines, books and projects. After all the work with my new patterns I’m definitely ready for a less brain consuming project. Earlier this week I started making blocks for a Queen Size quilt for DS1 and DIL. They are traveling Japan right now, so I decided to make a quilt from Japanese fabrics. I went for two different 12 inch blocks in soft colors. Now I’m looking for Japanese calligraphy signs to appliqué on. I’m looking for simple words like love, laughter, peace, sun, moon, earth, fire, water and so on. I also want to practice my turn under appliqué. Since I was inn to Japanese fabrics already I designed a ”lovely basket” to practice on. ;-) I’m on track again with this weeks focus, you see. We have a house guest for 3 weeks while DS1 and DIL are on vacation. Rex their cat has been a regular guest in our house over the years, but not for a long period of time without his masters. He was really grumpy the first couple of days. Now it’s all normal and Rex and Zappa is playing, testing each others traveling bag and Rex is giving Gizmo a friendly groom. They look after each other outside too. It is really sweet to see. Last week end was a nice experience. Our annual quilt meeting took place at this location. The main attraction was Yoko Saito giving classes and lectures. Unfortunately I did not send my application in time for class. However I enjoyed her work at the exhibition. This is detail from two of her quilts. I bought her latest book and got her to sign it. Very official and nice event. For those who know me, I did not return home empty handed. This is an overview of the things I found in all the nice stores. I even won a price at the Saturday lottery. We have a saying in Norway: Away is good, but home is best. It felt good to get home, sit down, remove socks and rest my feet. This weekend I am going to our annual Quilt meeting. I have been working hard to get my new patterns ready. Phu I tell you, it is not “a walk in the park”. My photo printer did not want to work with me so I bought a new one. But my new printer is eating ink, so I have emptied my local office supply store. I hope it will be enough to finish the patterns I had planed to bring. This is my biggest project ever. This pattern is made as a 10 part BOM. I enjoyed very much to make this project. I had Merete Ellingsen to do the quilting. I am very pleased. My first finish this year was a table runner. I have not shown this one earlier because this was also to be a pattern for sale. So, here it is. I guess you can see where my focus has been last couple of weeks. See you next week with new projects in mind.